Long discussed Temperance Flat Reservoir continues to be a project moving forward with environmental studies, detailed planning and public debate as California voters prepare to cast ballots on a state bond that could help pay its projected $2.6 billion cost. Some of those attending a Temperance Flat Project hearing in Fresno October 16 discuss the proposed reservoir’s features. The Friant Water Authority is finishing extensive comments on Temperance Flat’s draft environmental impact statement (DEIS) that are due October 27 and plans to propose that an additional project alternative be considered to broaden the San Joaquin River reservoir project’s integration with the state water system. Several comments were voiced during an October 16 hearing in Fresno on the DEIS. Temperance Flat Dam and Reservoir have been under serious discussion for nearly 15 years after having been identified in the CalFed Bay Delta Program’s Record of Decision. They have since been undergoing increasingly detailed study under in the U.S. Bureau of Reclamation calls the Upper San Joaquin Basin Storage Investigation. A new 1.33 million acre-foot reservoir would be formed behind a dam that would be constructed within Millerton Lake, nearly seven miles upstream from 70-year-old Friant Dam. Because Millerton Lake’s capacity would be reduced, the project’s net new storage would be about 1.2 million acre-feet, nearly twice the size of Millerton. The dam would be 665 feet high and the new lake’s maximum pool would be at an elevation of 985 feet, the same as a small Pacific Gas and Electric Company reservoir formed several miles upstream by 100-year-old Kerckhoff Dam. 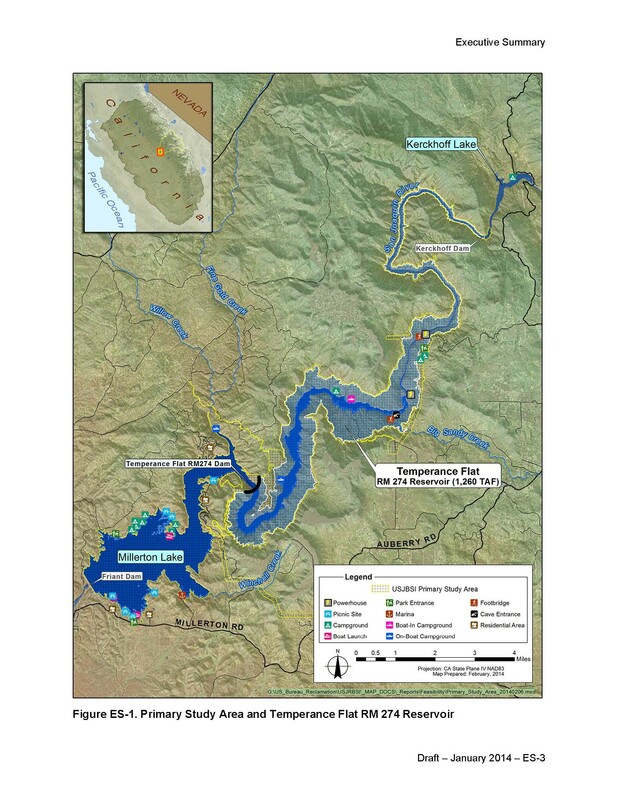 If built, the project would result in Millerton Lake becoming an afterbay with far fewer fluctuations in storage, most probably never dropping below 340,000 acre-feet. Friant agencies believe the reservoir would go a long way toward capturing big year runoff that now cannot be stored because Millerton Lake’s capacity of 520,500 acre feet is insufficient. Between 1974-2003, some 14 million acre-feet of water was flood released from Friant Dam because of a lack of storage space. A Reclamation study earlier this year found that the reservoir would be feasible. Temperance Flat would be a candidate for partial funding if Proposition 1, the state’s $7.5 billion water bond to be decided November 4, were to be approved. 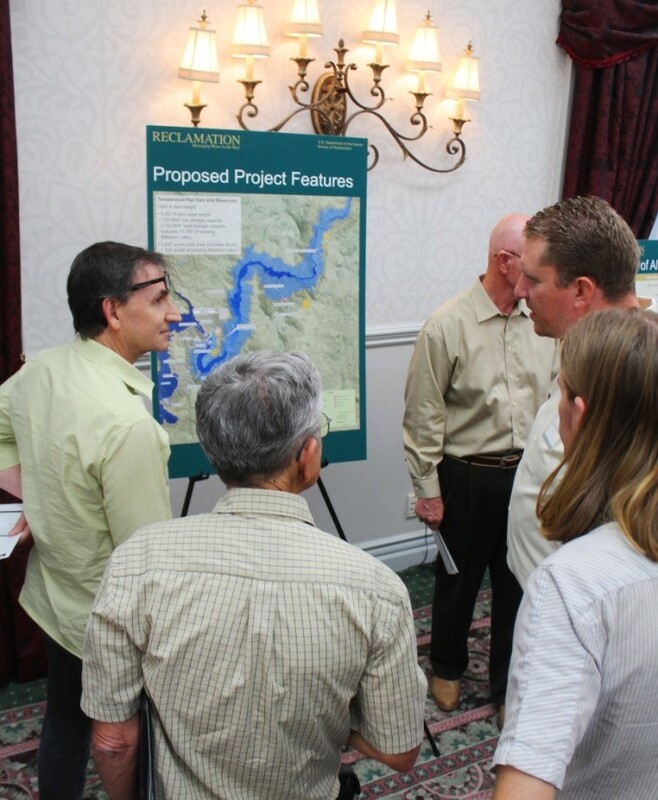 Other storage projects that could benefit from Proposition 1 include the proposed Sites Reservoir in Colusa County and enlargement of Lake Shasta near Redding and Los Vaqueros Reservoir in Contra Costa County. Reclamation staff member Michelle Denning opened the Fresno hearing October 16 on Temperance Flat’s draft environmental impact statement by saying the “project’s purpose is to increase storage on the San Joaquin River and improve water supply reliability and flexibility.” Ultimately, Denning said, Congress would have to decide if the project were to be authorized. Attending the Fresno hearing were about 100 persons. Opponents of Temperance Flat used the hearing to vocally criticize both the project and the environmental findings. Among them was Ronald Stork of Friends of the River who said the DEIS contains “precious little environmental values that are described” and contended the project would provide “just too little yield, assuming you folks can sort out who gets the water.” Stork opposed the notion of sharing water with other parts of the state. “That’s not what the CVP (Central Valley Project) was built for,” he said. A Sacramento environmental consultant, Steve Evans, complained that Temperance Flat would yield about 94,000 acre-feet per year and would not have supply benefits more than a year or two beyond a wet year. The reservoir would impact the San Joaquin River Gorge and its 86,000 annual visitors, he said. Others said that the Bureau of Land Management has proposed several miles of the San Joaquin River through the reservoir site to be designated as a wild and scenic river; that Indian tribes have sacred sites in the area and have federal reserve water rights; and that there had not been enough hearings on the issue. FWA General Manager Jacobsma said during the hearing that the Friant board supports continued consideration of Temperance Flat not only for its storage because its pool of colder water would be vitally needed for salmon that the new river Restoration Program aims to bring back below Friant Dam. “If you want to have fish, you have to have cool water,” Jacobsma said. As to claims made earlier that state and federal money would be solely used to build Temperance Flat, Jacobsma said, “The public only pays for the public benefits.” Those, he said, would likely be limited to environmental benefits. “Our interest is to keep the local supply here,” he said, although Friant believes “integrating Temperance Flat with local reservoirs and the western valley would truly make it a multi-purpose reservoir” and add to yield. Jacobsma said the FWA “does not like some of the alternatives” and would submit a new alternative by the October 27 deadline. Ishida said surface water is needed for the many disadvantaged communities in Tulare County and noted the county has had some 600 domestic well failures this year as well as increasing land subsidence problems. “Lindsay and Strathmore are totally on Friant water, and those towns and Orange Cove and Terra Bella would not exist without Friant water,” said Ishida.